In intraoperative intermaxillary fixation (IMF), bonding a minimally adapted, rectangular, stainless steel, preformed archwire directly to the teeth with a light-cured composite resin can offer many benefits to clinicians and patients. The procedure is easier and less time-consuming than conventional bracket placement, the risk of occlusal interference is reduced and the patient’s comfort is increased. With the use of composite resin, the wire fits buccal tooth surfaces accurately, thus creating a completely passive anchor unit. Crimpable hooks can be easily adjusted along the archwire, thus establishing different directions of postoperative elastic traction. Furthermore, this technique eliminates soft tissue injuries and tooth root damage, which are risks associated with the use of miniscrews for IMF. In this clinical report, we describe the case of a 50-year-old man, who required a passive anchor unit to assist IMF before undergoing maxillomandibular advancement to treat severe obstructive sleep apnea syndrome. Creating a completely passive anchor unit is of fundamental importance to assist intermaxillary fixation (IMF) in surgical cases, where no tooth movement or arch form modification is desired. This situation occurs in the sagittal expansion of the facial skeleton by maxillomandibular advancement to treat obstructive sleep apnea syndrome (OSAS)1 and in the management of maxillofacial trauma.2,3 Because of the recent increase in orthognathic surgery, without or before orthodontic intervention, such as surgery-first orthognathic treatment,4 the need for such an anchor unit is pressing. This article describes a simple procedure used to position passive archwires for IMF in surgical cases. A 50-year-old man was referred to the department of orthodontics, University of Bologna, Italy, by a sleep disorders clinic. He was diagnosed with severe OSAS: apnea hypopnea index (AHI) = 70.9; lateral AHI = 31.7; supine AHI = 85.2; mean level of arterial oxygen saturation (SaO2) = 92.8%; lowest SaO2 = 78.0%; average desaturation = 8.4%; duration of sleep with SaO2 < 90% = 14.4%. These events were ameliorated with continuous positive airway pressure, but the patient was unable to tolerate the therapy. Thus, he elected to undergo maxillomandibular advancement and required a passive anchor unit for IMF. The patient presented with an occlusal sagittal molar relationship of Angle Class I on the right and Angle Class II on the left, severe maxillary and moderate mandibular crowding and anterior deep bite (Fig. 1). Figure 1a: Intraoral frontal view of the anterior deep bite. Figure 1b: Intraoral view of Angle Class I malocclusion on the right. Figure 1c: Intraoral view of Angle Class II malocclusion on the left. Figure 1d: Maxillary occlusal view showing severe maxillary crowding. Figure 1e: Mandibular occlusal view showing moderate mandibular crowding. Impressions were taken of both arches and 0.018 × 0.025 inch, rectangular, stainless-steel archwires were bent to fit the models. Thus, despite severe crowding of the patient’s teeth, only minimal bending was required to achieve passive adaption of the archwires to the buccal surface of the teeth (Fig. 2). Crimpable hooks were positioned along the archwires, at interdental sites. Figure 2a: Frontal view of the rectangular stainless-steel archwires bent to fit the buccal surface of the teeth on the models. Figure 2b: Maxillary occlusal view of the archwire on the model. Figure 2c: Mandibular occlusal view of the archwire on the model. The patient’s teeth were pumiced, etched, rinsed thoroughly and dried. After adhesive was applied, the archwires were seated and a small amount of light-cured composite resin was applied to the buccal surfaces of the teeth. Once the wires were secured, additional resin was applied as needed (Fig. 3). Figure 3a: Intraoral frontal view with the archwires in place. Figure 3b: Lateral view of the right side. Figure 3c: Lateral view of the left side. Figure 3d: Maxillary occlusal view after archwire placement. Figure 3e: Mandibular occlusal view after archwire placement. Several methods, each with some advantages and disadvantages, have been proposed for IMF for surgical patients: arch bars, various ligature wiring techniques (causing trauma to gingival margins and preventing optimal oral hygiene) and, more common, orthodontic fixed appliances.5 For the latter, the standard procedure is to insert into brackets a rectangular stainless-steel archwire, which is bent passively to the alignment of the brackets to maintain the pre-existing position of the teeth. However, the bending procedure is difficult, time-consuming and depends largely on the skill of the clinician. It can be performed either directly in the mouth or indirectly on models, the latter with the advantage of saving operative time but the disadvantage of increasing cost. Moreover, preoperative impressions may be both painful for the injured patient and difficult to obtain. As it is almost impossible to bend an archwire to be perfectly passive,6 the use of wire cross-sections smaller than the slot of the brackets is required in either the indirect or the direct technique, and some play between the wire and the bracket always persists. This implies less than optimal control of the tooth position and, thus, unwanted tooth movement. As an alternative, a minimally adapted, rectangular, stainless steel, preformed archwire can be bonded directly to the teeth with light-cured composite resin. The procedure is easily performed by the clinician and, as bracket placement is not required, this is a useful alternative when mouth opening is painful and difficult as a consequence of trauma. Premature occlusal contacts are reduced because of the absence of brackets, which can result in inter-arch interferences when placed at the mandibular arch, especially in patients with anterior deep bite. As play between the wire and the slot of the bracket is eliminated, larger wire cross-sections (0.018 × 0.025 or 0.019 × 0.025 inches) may be used, thus increasing rigidity and providing greater control of tooth position. Moreover, use of the composite resin allows the wire to fit the buccal surface of the teeth accurately, thus achieving a completely passive anchor unit, with no unwanted tooth movement. Crimpable hooks can easily be adjusted and positioned as needed along the archwire, at every interdental site if necessary, thus allowing optimal control of the direction of postoperative elastic traction. The use of miniscrews for IMF in surgical cases has become popular recently,5,7 and the idea that their placement is easier than conventional bonding of brackets to all teeth and placement of stainless steel archwires is probably widespread, especially among surgeons. 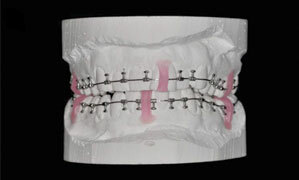 Undoubtedly, miniscrews are indicated in patients with extensive crown and bridgework, where failure in bonding can occur. However, as the insertion of miniscrews is a surgical procedure, potential complications may arise and biologic cost to the patient increases. Although their placement is considered to be easier and faster than placement of conventional archwires, an accurate clinical and radiographic evaluation is necessary before surgery to minimize the risk of damage to an adjacent tooth root. Moreover, miniscrews cannot be inserted at any point along the dental arch, thus implying less than optimal control of the direction of post-operative elastic traction. The technique described in this case report may be a useful option to assist IMF in surgical cases. Costs to the patients are not greater, in both economic and, more important, biologic terms compared with other surgical or orthodontic IMF methods. The main drawback is the risk of detachment of the light-cured composite resin, although it can easily be replaced. The procedure is conservative with regard to soft tissues, it entails no risk of tooth damage and it is also indicated for avoiding pain related to mouth opening after a trauma because of the reduced operative time compared with placement of conventional brackets. Moreover, the composite resin is more comfortable for patients than conventional brackets. The greater rigidity of the resulting anchor unit ensures better control of the position of the teeth. Furthermore, as the crimpable hooks are easily adjustable on the archwire, various vector forces may be established during IMF where optimal control of the direction of the postoperative elastic traction is deemed desirable. Dr. Alessandri Bonetti is an assistant professor in the department of orthodontics, School of Dentistry, University of Bologna, Bologna, Italy. Dr. Incerti Parenti is a postgraduate student in the department of orthodontics, School of Dentistry, University of Ferrara, Ferrara, Italy. Dr. Gracco is a visiting professor in the department of orthodontics, School of Dentistry, University of Ferrara, Ferrara, Italy. Graham JW, Cope JB. Potential complications with OrthoTADs: classification, prevention, and treatment. In: Cope JB, eds. OrthoTADs: the clinical guide and atlas. Dallas: Under Dog Media LP; 2007. p. 119-34.